In the last section we looked at the importance of implementing strong page titles, but every page title needs an equally informative meta description below it. Let’s find out the details and best practices around one of the most well-known of meta tags: the meta description. How do meta descriptions influence search engine results? By optimising a page’s meta description you can increase the click-through rate from search results pages, in a similar way to optimizing page titles. Tailoring meta descriptions to grab a searcher’s attention, better meeting searcher intent and better summarizing the page’s content are all methods by which you can achieve a higher click-through rate. It is important to note that meta description tags are not a ranking signal in Google’s algorithms and therefore do not directly influence rankings. Google doesn’t have a fixed length for the snippets in search results where meta descriptions appear because they are generated dynamically. However, it is considered best practice for meta descriptions to be between 155-160 characters for Google’s search results and 150 characters for Bing’s search results. In December 2017, Google tested featuring longer meta descriptions in their search results, with an average character limit of 230 characters. A few months later after the change, Google reverted back to the lower character limit. These changes, coupled with a lack of any official guidelines, make it difficult to make recommendations about meta description length, but focusing on the quality of the description itself is more important. Meta descriptions should be unique and contain relevant copy that reinforces the page title and encourages the user to click through by providing a concise summary of the page’s content. Good meta descriptions should try to match keywords in the description to search terms you expect users to use when searching for this page. Google will embolden keywords that match the query string within the description. 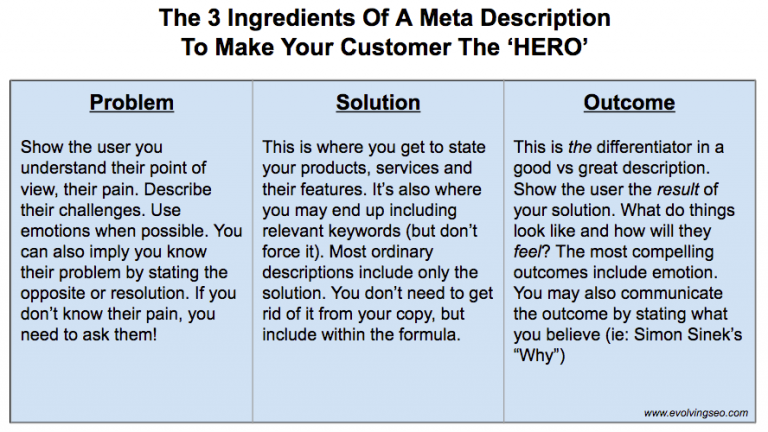 Dan Shure has some great tips for writing high quality meta descriptions, as outlined on Evolving SEO, using the “three ingredients” in the image below. Ideally, each of a site’s meta descriptions should be unique, but for large dynamic sites this isn’t feasible. For larger sites, it is recommended to template the structure of descriptions with predefined elements which include certain sections of content from the page to ensure uniqueness and avoid mass duplication. Using double quotation marks because Google will truncate at the quotation mark. Duplicating meta descriptions for multiple pages. Writing short meta descriptions that don’t make full use of the space available in search results. Maximizing the character space in meta descriptions gives you the best chance of including powerful calls to action and important keywords which can contribute to improved click-through rates as well as providing more information to the user.